Stream, download, and game without missing a beat. With the large 128MB RAM, you can now connect multiple Wi-Fi devices. Using four high-performance antennas and 802.11ac wireless technology, Mi Router 3 provides uninterrupted Wi-Fi coverage homewide. delivering the fastest possible Wi-Fi and maximium bandwidth for all internet activities on your devices. Enjoy strong Wi-Fi throughout your home and beyond. The 4 high-performance antennas feature 2.4GHz and 5GHz Wi-Fi bands for stronger and more reliable connections for all your devices. The large RAM allows up to 126 devices to connect at any one time while keeping each of those connections stable. Mi Wi-Fi app lets you control your network from anywhere. see what’s connected and more. The best part? You can do all of it right from your phone. Anytime, anywhere. Parental controls let you manage what your children can and can't see, even when you aren't home. You can manage, control, and monitor the sites visited - and for how long. Receive a notification when a new device connects. You can prevent unauthorized users from using the network by blacklisting them with just a few taps on your smartphone. With just one button, boost Wi-Fi speed and reduce bandwidth bottlenecks using cutting edge technology. We re-thought every aspect of the router from the ground up to provide superior, efficient performance. It all starts with a four antenna design that increases and strengthens signal. 128MB of built-in RAM allows more connected devices. 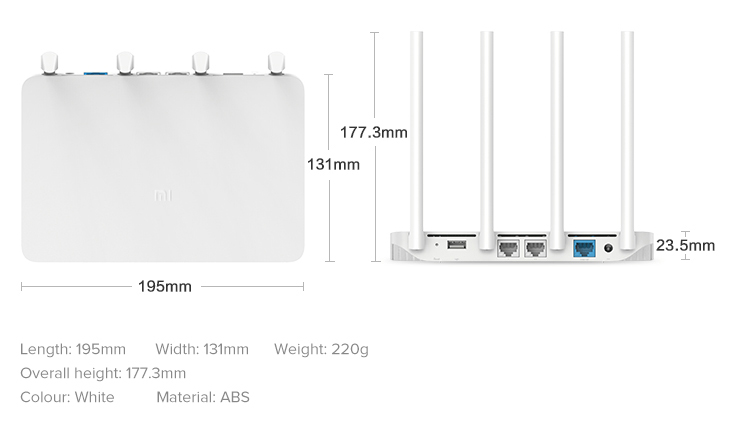 Its chassis has 411 heat dissipation holes and 3 back ventilation openings, allowing Mi Router 3 to run at optimal temperature.